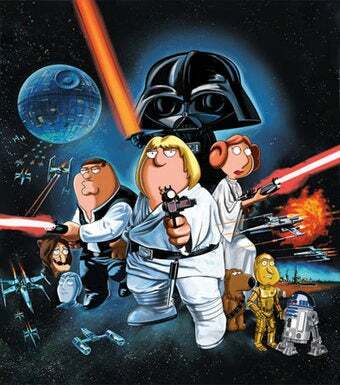 Family Guy will soon revisit Star Wars, as the show's Comic Con panel unveiled new footage from their upcoming Empire Strikes Back parody. The entire episode is due out by Christmas – if they can get it done in time. The footage they screened promised a mix of targeted Star Wars riffs and references to science fiction in general, with both Elroy Jetson and Leonard Nimoy's mailbox putting in appearances. The clips also showed the Rebels taking doomed gunner Dak Ralter's pre-battle boast surprisingly literally, as well as just who is allowed to use the term "nerf herder." Family Guy creator Seth MacFarlane also mentioned that James Woods will have a cameo in the episode. The episode had once been planned to premiere towards the end of Family Guy's current season, but MacFarlane is optimistic they can get it out by the end of 2009. Looking even further ahead, showrunner David Goodman, who also wrote the Star Trek mega-homage "Where No Fan Has Gone Before" on Futurama, is currently working on the final part of the parody trilogy. Their Return of the Jedi spoof was originally entitled Episode VI: The Great Muppet Caper in reference to its infamously cuddly Ewoks, but fears of copyright infringement made them go with the current title Episode VI: We Have A Bad Feeling About This. Whatever the title, I think it's fair to say we can expect no shortage of Ewok jokes.